What’s more frustrating than sitting on the side of the road with an overheated vehicle? Whether it’s the sight of the steam coming from the hood or the smell of hot coolant splattered all over your engine compartment (or puddled underneath your vehicle), few things put a damper on weekend cruise like an overheated engine. We’d strongly advise you to avoid this situation, and you can start by having a strong, healthy radiator for your vehicle. With help from the Summit Racing technical department, we’ve put together an overview of common radiator styles, materials, and designs. 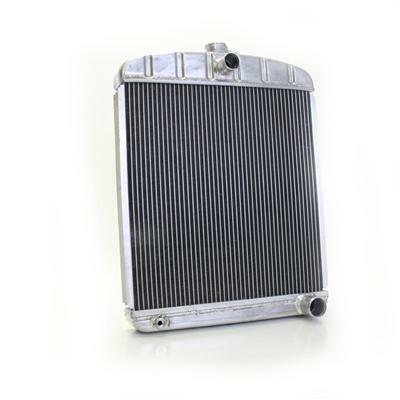 This basic knowledge will put you on the road to picking the optimum aftermarket radiator. Radiators are often broken down into two main styles: crossflow and downflow. core. The coolant travels horizontally across the core from the inlet side to the outlet side with the help of your water pump.In contrast, a downflow radiator has tanks running horizontally at the top and bottom. The coolant enters the top of the radiator and travels vertically through the core and leaves through the outlet at the bottom. Because the coolant flows from the top down, the water pump is aided by gravity, which allows the coolant to travel more quickly through the radiator.So which is better for your vehicle? 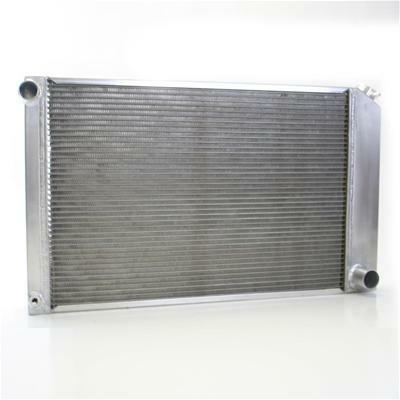 Because of its heat dissipation abilities, along with its (typically) larger core surface area, the crossflow radiator is often the best choice for high-rpm, high-output engines. On the other hand, downflow radiators can provide an original, nostalgic appearance and can often fit where crossflow radiators will not. Cramming a crossflow radiator into an older engine compartment designed for a downflow will often require fabrication. As always, you’ll need the proper fan, water pump, and thermostat to maximize your radiator, whether it’s a crossflow or downflow design. The two main types of radiator materials are aluminum and copper-brass. Copper-brass radiators came standard on older vehicles and were found on some vehicles all the way into the 1980s. For a vintage or period-correct look, it’s hard to beat a copper-brass radiator. It’s also hard to beat copper-brass for heat conductivity. So why the switch to aluminum radiators in recent years? While copper-brass is a great heat conductor, it is also a relatively weak material when compared to aluminum. To avoid ballooning or bursting under pressure, the diameter of the copper-brass tubes that carry coolant needs to be kept small. And that’s a big problem when it comes to cooling capabilities. Because aluminum is stronger material than copper-brass, aluminum tube diameter can be increased to flow more coolant. That means more coolant is exposed to the heat exchange process, giving the radiator a greater cooling capacity. A second—and more obvious—advantage to an aluminum radiator is weight. Because aluminum weighs approximately 60 percent less than copper-brass, an aluminum radiator is often the ideal choice for high performance and competition engines. There’s one more advantage to aluminum radiators: reduced row quantity within the radiator core. As we mentioned earlier, radiators consist of a row or several rows of tubes and fins, which transport the coolant. Because aluminum is much stronger than copper-brass, tube diameter can be increased without having to add thickness to the tube walls (a necessity when increasing the size of copper tubes). As a result, a two-row aluminum radiator with one-inch tubes will dissipate heat at about the same rate and efficiency as a five-row copper-brass radiator with smaller, half-inch diameter tubes. This two-row design also causes less air restriction through the core, allowing your vehicle’s fan to more effectively aid in the cooling process. We’ve covered the basic radiator styles, materials, and designs. In general, aluminum radiators are the ideal choice for high performance, high-output vehicles, competition cars, and custom street rods. Copper-brass radiators make a great choice for restorations or a nostalgic look. 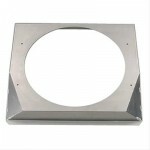 A fan should is recommended, where possible, to facilitate proper airflow through the radiator. Armed with this knowledge, your parts salesman will be able to steer you in the right direction. 1 BTU (British Thermal Unit) is the ability to transfer 1-degree of heat, from 1 pound of any material or substance,in one hour. Transfer just 1-degree of heat energy from 1-pound of aluminum to 1-pound of air. It takes 32,267 cubic feet of air to cool 0.1337 cubic feet of aluminum. There is a finite amount of air-molecules that will fit through the available vertical/horizontal “space” of your radiator, and depending on how fast they are traveling will determine how much energy they can absorb from the time they enter the front until they exit the rear of the fins. So, the only way to increase the amount of energy the air will absorb is by adding depth to the fins. On a 2-inch deep radiator, each 1/2″ represents 25% of total energy being transferred from the aluminum fin to the air. so if your radiator is 1/2-inch thinner, you have 25% less cooling capacity (all other factors being equal). Remember, it’s always about surface area contact. A 3-foot x 4-foot (x 1/6-inch thick/deep) sheet of aluminum can transfer its energy into the 12-square-feet of surface-area of air that touches it. Take the same amount of aluminum and make a 3-inch x 3-inch x 3-inch cube. Even though both pieces are 1-pound (approx.) and have the same 10-cubic inch volume, the cube can only transfer the heat-energy from the surface-area of its six, 3-inch x 3-inch sides. The sheet has 144 square inches of surface area touching the air, while the cube has only 15 square-inches of surface-area touching the air. The more surface-area, the faster heat will move from one thing to another. 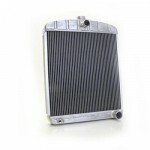 Scott, A ½” in overall width will not adversely affect the performance of the radiator. It will be fine! If I were you, I’d go back to whoever taught you that and demand a refund. On a 2″ thick radiator, that 1/2-inch represents 25% of cooling capacity. Do you provide any guarantees with your sophistry or perhaps you include a wormhole, where the primary “LAW” of thermal-dynamics doesn’t apply? Hi im from the UK. I have an rs turbo 1.6 cvh at 250 bhp with big intercooler and a radiator behind it. 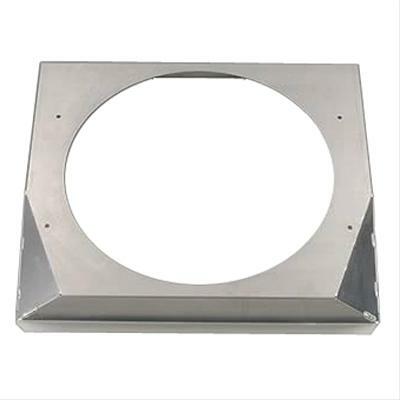 Would it be better to have fans in between the rad and cooler or the back of the rad pulling air through both?? Thanks for reading! Fans should always go behind the radiator in a situation like yours. 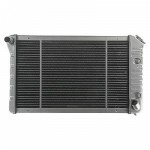 Keep the air gap between the intercooler and radiator to a minimum as well to stop turbulence between the cores. Hey Roland, that’s difficult to say for sure. The short answer is yes, a properly designed 2-row aluminum radiator will cool just as effectively as its 3-row brass/copper counterpart. The folks at Hot Rod magazine have an in-depth article weighing the pros and cons of both aluminum and copper radiators–it’s a good read. But before you go spending money on a radiator, are you sure it’s the problem? Check your fan(s) to ensure they’re working properly and, more importantly, make sure the shroud around your radiator is intact and the air path into and out of your radiator is clear. Here’s another good article with some more links about troubleshooting an overheating engine–just to ensure your problem doesn’t reside elsewhere. HI! I am currently getting a 1965 chevy c10 that was handed down to me back in running order. It came with a 283 originally but has since then had a 305 put in it. My dad said, back in the day, it would run hot. I believe it has the stock radiator in it. Long story short it has sat for 20 years and the coolant inside has all but dried up. I want to replace it but i’m not sure about what radiator to put in it. Original stock radiators for that truck run 400 dollars but aftermarket i’ve seen 100-200. I just need help with something that would work for it. Thanks!